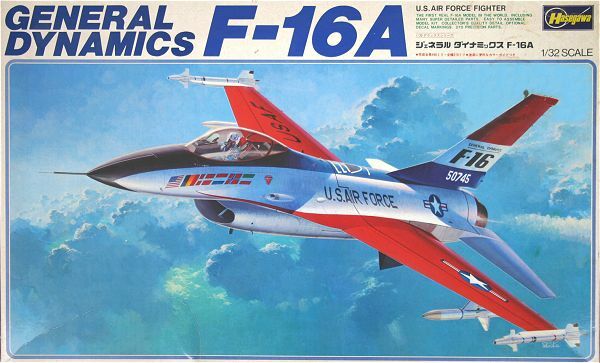 Hasegawa released the 1/32 scale kits of the F-16 years ago and in several boxes and kits. The basic model remained the same and although very good at its days, it is nowadays inferior to the newest Tamiya and Academy kits. 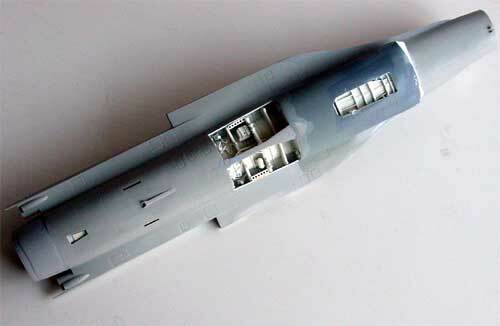 The Hasegawa kits have mostly raised panel lines and represent the older types of the F-16 with the "small engine intake" for the P?W F100 engine, thin wheels for normal weight and older style cockpit. 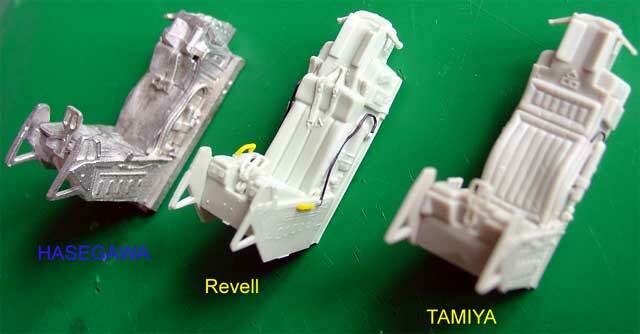 Note: the Hasegawa kits can not be used for later style F-16's with the big intake and GE F110 engine. Hasegawa kit # S25 is for the F-16A "Plus"
[H1]: using kit # S25: Conversion into an F-16A "block 15" but updated to MLU (mid life update) as flown by many European NATO air forces including the Royal Netherlands Air Force (KLu) . It would require some updates in the black cockpit area capable of nigh operations with night vision goggles, slightly changed cockpit instruments , and various added antenna and ECM bumps. 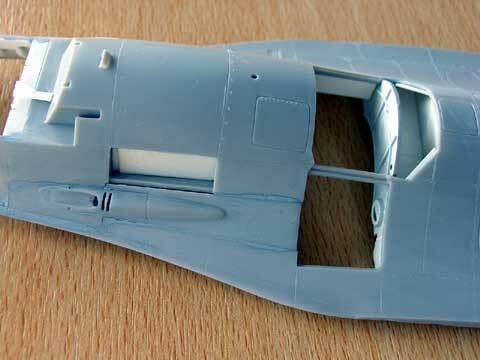 To add interest even further, it was decided to open up some airframe panels and to display an open engine bay area. [H2]: using kit # S27, only an early "c" with small intake can be made. 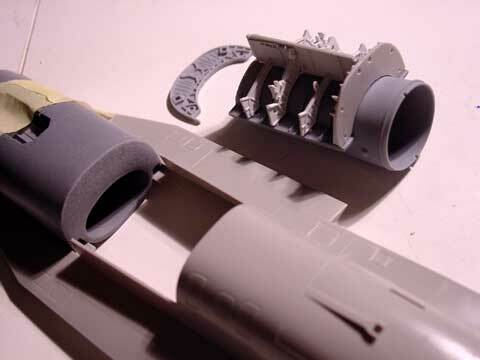 In order to make a F-16C "late block 30" with large intake, thick finbase. higher weight capability with thicker main wheels and thicker bulged main door, the Cutting Edge # CEC32-114 Big Mouth conversion set was used. It has both a new intake and the required thicker wheels and main gear doors. 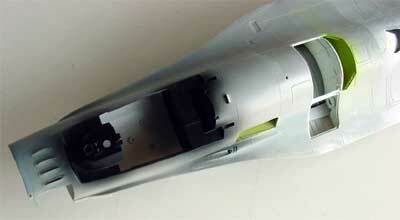 The later F-16C would also require small added details in the cockpit area. 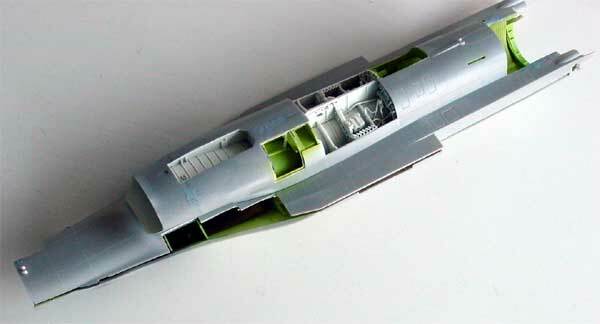 For added detail also the Eduard etched metal set # 32-052 for the F-16A will be used. First, as these kit have some raised panels in areas, these were inscribed on the main parts like wings and tails and the raised panels sanded off. Doing it now will be much easier as the parts are still not assembled. [H1] MLU : In this case the to be opened airframe panels were sown / cut out. The engine panels were also "removed" and separated. The main cockpit opening is a bit too long. At the rear a strip was added to make it a bit smaller , about 5 mm wide. 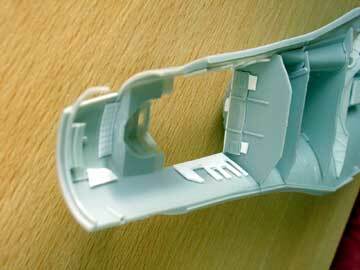 Also it was decided to open up an additional ammunition panel in the upper fuselage for the [H1] F-16 MLU kit. [H2] F-16C : no major surgery needed here. 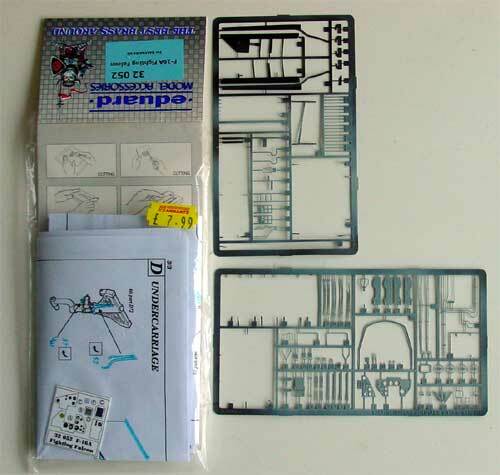 The Hasegawa kits supply you with two instrument panels : part # J9+J4 for a F-16C and parts # D60 + D50 for an early F-16A. (note: the instructions do not mention them, but they can be located from the sprue chart on the last page of the instructions). The MLU however requires a very similar to the F-16C instrument panel. inner cockpit details; also note the smaller cockpit opening made. 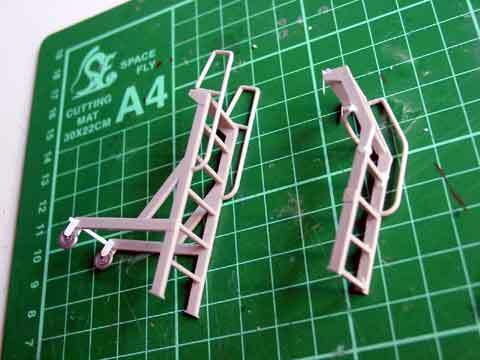 Hasegawa kits quickly came with a metal ejection seat (although the older style seat is still in the parts' sprues). The metal seat is basically good but needs some extra details of strip, rod and tape for the belts for example. The real F-16 seat however remains a "clean" type. The "instrument cover" below the HUD is not entirely correct. It should have a slightly different shape, see pictures of the real plane. The cockpit area of both kits got scratch side walls with added detail. This was made from thin card, stretched sprue and wire. The MLU cockpit is black, the F-16C cockpit medium grey. If you want to use a pilot, find another one than in the kit! The kit ladder/step access is not often used. [H1] MLU : use the standard Hasegawa intake. [H2]: For the F-16C do not use the intake parts #C40, C23 and C39, but the Cutting Edge set. The intake of the Cutting Edge set needed a lot of preparation time. Please first measure twice where to cut and saw. I made an error here and needed a lot of filling and sanding later on. Detail as needed, add side walls etc. I also opened up the refueling panel at part # C21 for the [H1] MLU kit. Part # D61 engine intake heater probe should really be fitted here! Leave this step until later on. use as needed, do not fit the canopy parts yet! The canopy was not only clear on real planes but have been seen with various hues and shades of transparent gold, smoke and even blues. More on that later on. [H1] MLU version will be displayed with a detailed avionics and radar area. 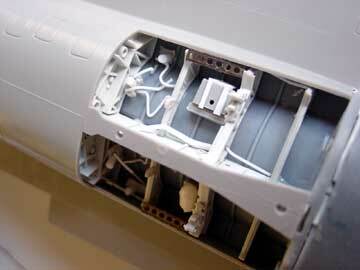 Undercarriages in 1/32 needs some extra detailing with wires and breaking tubes etc. These kits are no exception. Some tubing was also added in the main gear bay and a battery pack was added. use parts as desired. I use the open brakes for the [H1] MLU kit. 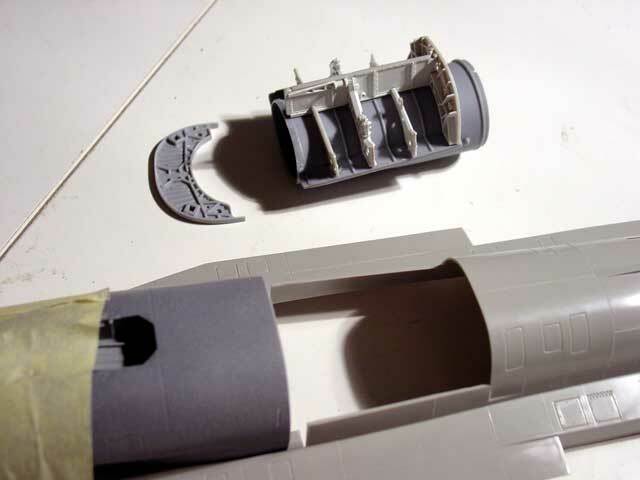 As the F-16 MLU engine bay was to be displayed with details, the panels were cut out at before even starting with the kit. Details from scratch were added in the engine bay area. To the right, the main gear bay is seen. 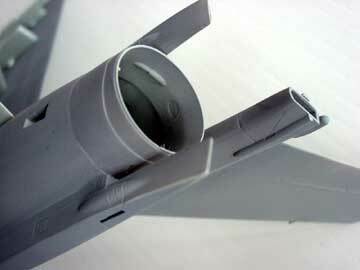 [H1] MLU kit will required thin base tail as supplied with tail parts #B7 and B8. Because the F-16 MLU as used by the RNethAF has in addition a longer and different parachute housing some scratch building is needed here. Note that these para packs may differ between MLU versions and countries. The conversion was made using card and filler. (note: if you have the Academy kit, these parts are supplied). Also, some side fairings and bumps are added from card. 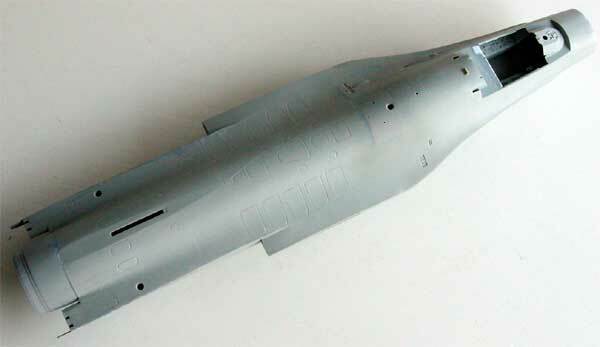 [H2] F-16C requires the thick base vertical tail and it is supplied in the Hasegawa kit as parts #J14+J15. Underlying stores, missiles, tanks etc are to be used as desired. 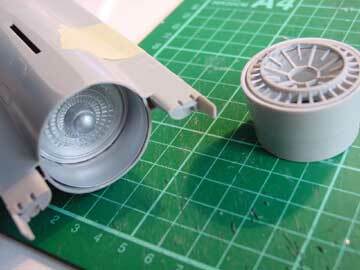 Replace with better finer parts if you have them. 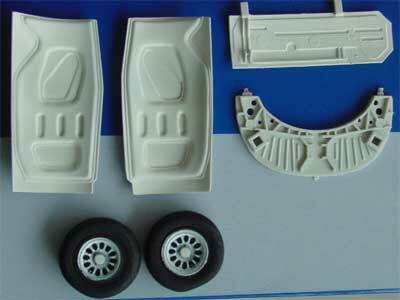 The 1/32 stores can be obtained from various other kits. 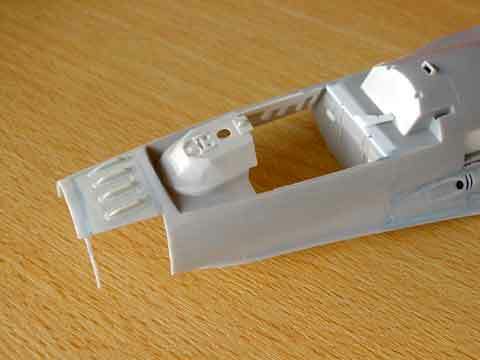 If you want to use the kit's wing fuel tanks, replace the moulded on fins with thinner card ones. 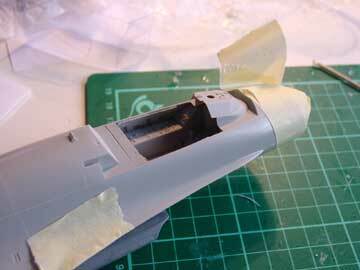 F-16C, with closed panel, filled and sanded. 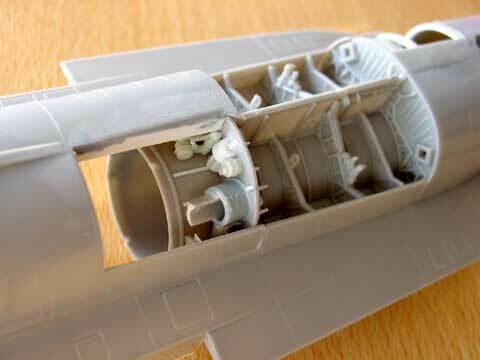 [H2] MLU kit will be given detailed scratch avionics bays etc. 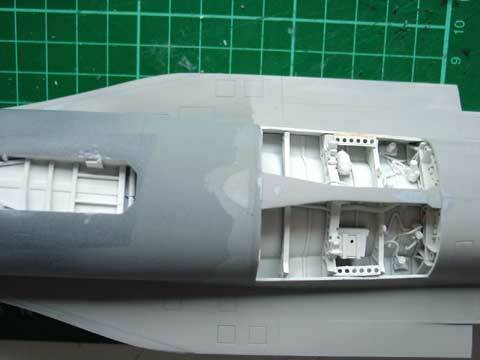 A picture is seen here of the lower fuselage. [H2] F-16C: on the wing leading edge two small RWAH antenna fairings should be added. These are not supplied in any kit, so make from scratch rod.